The INSPEM service was introduced in 2015; it allows users to find other people that they have randomly encountered on the subway, in the parks or any other locations. We assumed that such kind of service would predominantly be used by the male audience. However, as the statistical data shows, females made 40% of all announcements. Ladies have been simply taking pictures of the guys they liked on the streets from the afar, uploading those pictures to our service and waiting for some acquaintance to recognize that guy and share his social network profile. This is exactly what the first version of the product was a few years ago. At the time of foundation of the service we wanted to become some sort of an analogue of «Wait for me» TV show, but as an online service. For your information: «Wait for me» is a Russian TV show that helped to find more than 200 000 of people since it first aired in 1999. A new request to find people from all corners of the Earth is received every 10 minutes. More than 3 million of lost people are in the show’s database. There are only two countries, in which «Wait for me» does not search for people yet, and those are Antigua and Barbuda and Cape Verde. By 2016 already, we decided to change direction. Our desire to reach the multibillion market and become a more technologically advanced company, which employs artificial intelligence and is able to apply video analytics based on learning neural networks for face recognition – these have formed a new vision of the INSPEM platform. Employment of Big Data and advanced video analytics allow us not only to satisfy the requests of private individual to solve everyday tasks, but also to use our resource to solve more noble and important tasks. These tasks include the city safety provision, direct involvement in criminals search, saving people’s lives on the streets, becoming a more effective way of missing people search. In collaboration with the world’s IT giants we would be able to establish «smart cities». the search is limited by a specific data base. the video data is received from a limited number of devices (government owned cameras, commercial cameras within a certain object). Quite a lot of time passes from the point a person has gone missing until the start of the search for them. Search squads and police still search for missing people using flashlights in the outdoors and abandoned buildings. If that person is not wanted on a federal or international level (which does not happen in such cases), their relatives have little to no chances to find them in another city. It’s often that the information on persons movement could be obtained through quicker, more technological approach. There is currently no unified database, to which one could have uploaded a person’s picture to track their movements around the city or the country. The police has one database, the Interpol has another, the search squads has yet another and so on. All these factors stand in the way of quick determination of the specific person’s location or their movements. Looking for a person, who was in a specific place at specific time and you need to contact them? Found someone on a subway or in a park/bar/nearby car attractive, and you do not know how to find him or her? Got your wallet, bag or other valuable item stolen? Find witnesses or video footage from the crime scene. For the majority of citizens the access to the third-party surveillance cameras footage is still impossible. It usually becomes possible only after an appeal to the police or by the judge’s decision. It is critical in those cases, when the footage has to be obtained swiftly. Each city has a continuing «blind» zone problem; those are the zones outside the cameras sight. This problem is even more pronounced in the small towns. The large scale of the INSPEM service allow carrying out the search in any corner of the Earth. The INSPEM ver.2.0 platform would employ the advanced video analytics based on learning neural networks for the swiftest and the most effective face recognition. Our technology is built around the main principle: being able to find a person without revealing their personal information, which is of utmost importance in most of the countries. 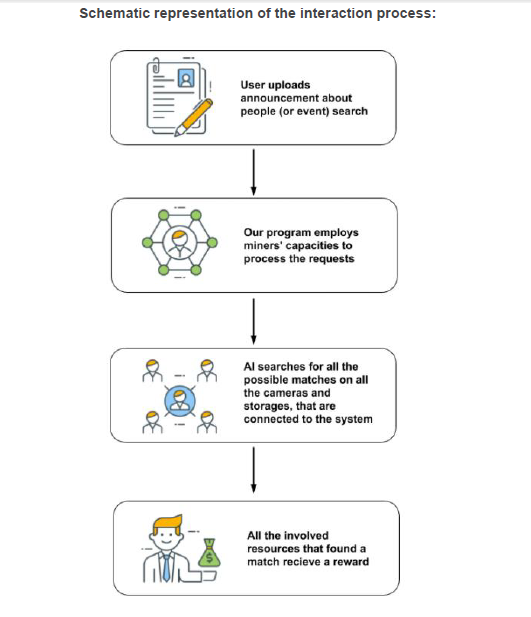 Any person on the planet would be able to connect any IP-camera, smartphone or a driving recorder to our platform on a software level. The connection would be established by the means DynDNS or P2P services, which are the most accessible for the regular user. The camera would remain at the same place and record footage as usual. The only requirement is the Internet connection. Then the user logs into INSPEM, registers his camera by specifying its serial number and password. After that, the service requests the network location of the camera from the vendor’s server and passes it to the nearest (in terms of the network) host for processing. What we get is the decentralization and the minimal network load. Vendor’s servers together with INSPEM participate in the connection establishment stage, while INSPEM tracks the analytics operations and receive results. The INSPEM platform does not record videos from the user cameras on its side: firstly, that would violate our confidentiality principle, secondly, that is a colossal amount of data, the storage of which would be costly and unnecessary for us. scaling limit, which every local video analytics system is bound by. Decentralization would also promote effective network traffic distribution, since it would go the briefest way. Any user would be able to upload the picture of the searched person to the INSPEM service. What we get is the large database of people pictures, on one hand, and the large amount of video cameras (up to 1 million devices market potential), which analyze the continuous face flow in real time. When a match is found, the platform exchanges both sides with valuables: a reward to a video camera owner for the provided resource, and the image of the recognized face with the video camera’s geographical coordinates. This is what happens in detail. The search commenced, and the possible positive results have shown up. A user browses through them and clicks on the one that he thinks is the right one to get additional information. That is precisely the action that is deemed as a true positive result that costs the user, for example, the price of 0.01$. After that, the user receives a geolocation and an offer to watch the captured footage fragment with that specific episode, but it would cost the user additional 1$. When the user selects the preview, the platform uploads the video fragment to its servers without the need for camera’s owner authorization (the owner accepts or rejects that feature upon registration), and stores it for 1 day. If the user decides not to pay for the full video, the INSPEM platform automatically deletes it from its servers after 24 hours have passed. In that case the user receives the unique search result number and has an opportunity to come back later and download that video clip, but now for the price of 2$ (if it’s technically possible by that time). 5000 of registered users. Second version of the site and mobile apps. First sale in AppStore USA. INSPEM engine updated. 10 000 of registered users. First conversations on Al implementation into the INSPEM service. Pre-Sale preparation and realization. Signing of partnership agreements with some technological market leaders. 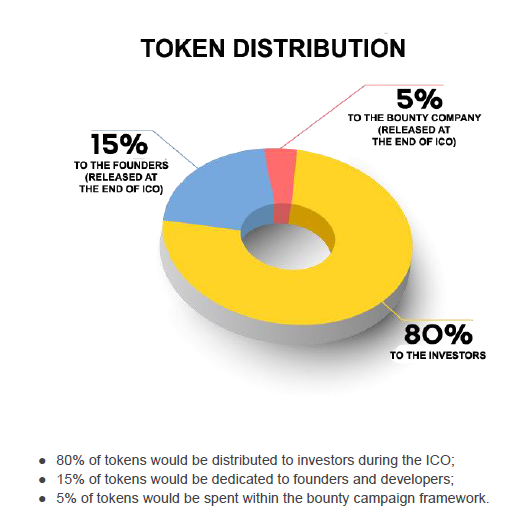 Realization of ICO. Team expansion. First pilot version which employs Al on INSPEM platform. Fully functional support of Al-assisted face recognition and any user photo/video survallance cameras. API ready for external services connection. Integratuon with the Ambulance Drone service. Demonstration in Amsterdam.